"The Guilty Meddler," episode 1? I haven't read the book. I've only seen the film once. And yet his internal struggle couldn't have been more clear to me. I think you're seriously understating the extent to which the film subtly portrays Northup wrestling with his feelings of superiority and difference internally. I'd argue that it's the subtext of nearly every scene in the film and that the writer, director and actor consciously chose to build their film around this struggle, which is why scenes that might otherwise feel gratuitous or repetitive or play better in a book where we have direct access to the character's reflections manage to convey so much tension and emotion. Fortunately, your claims are eminently testable. The film is still in theaters, about to come out on Blu-ray/DVD and already available for rent from some pay streaming services. We could all watch it again and follow along with another post that's a detailed beat by beat analysis of Solomon's arc or of full on run through your checklist. Baring that, the most natural road map for Northup's development is the Kubler-Ross stages of grief. I've said before that Solomon has a Rites of Passage arc. Often these arcs are about "acceptance." But not so much rolling over passively or merely giving in to one's Fate as the sort of profound acceptance that goes hand in hand with deep humility and radical serenity ("the things we can not change..." etc.). Always lurking in the background of such an awareness is a true confrontation with one's mortality. We're talking Buddhists meditating on bones type stuff. 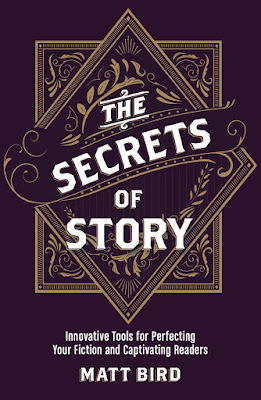 I'm also reminded here of Brian McDonald's second book THE GOLDEN THEME, where he elaborates on these ideas, positing a kind of Ur-theme beneath all stories, one that's haunted by the inevitability of human suffering and eventual death: that we are all the same. The key moment in this arc for me comes when Northup joins a group of slaves singing spirituals at a funeral. I've had some people tell me he looks utterly broken in this moment. They take it as a low point. I don't disagree with that. I might even say he himself doesn't understand the full significance of what he's doing by giving himself over to the group. In Kubler-Ross stages he's right on the cusp between depression and acceptance. And the possibility of Northup's physical freedom doesn't occur until he's crossed that threshold. But there are so many other moments in the film that you could see this way. 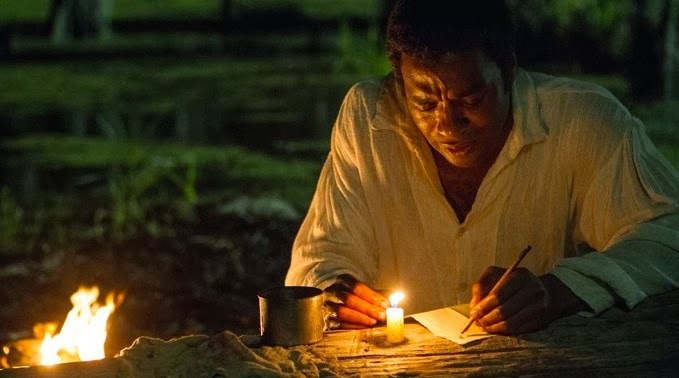 The whole sequence of standing up to the white slave driver is some of the most external action in the film, yet the entire point of it is the horrible realization at the end that the well educated enlightened cultured plantation owner doesn't care about Northup's legal status or past history. That the integrity of the system of slavery itself is what matters. Here Northup's halfway between anger and bargaining. Then there are more subtle interactions with fellow slaves. In one scene Northup scolds a grieving mother, who can't stop crying for her stolen children. This isn't only about the obvious things -- his surface annoyance in that moment of trying to concentrate or the slightly deeper reminders of his own family he's trying to keep at bay. This is about the fundamental nature of his bargaining with his Fate. On the order of, "Okay, I'll accept this, for now, but that doesn't mean I actually have to experience it. I'll just chose to hold myself back, to not interact, to not feel." Because acceptance isn't really true acceptance unless you accept all of the feelings that come with it and truly allow yourself to feel them. This is a common misconception/mistake that religious novitiates make too. They imagine that somehow a life of prayer or meditation will remove them from the tumultuous passions and emotions of the outer world. When the entire aim of these practices is really the opposite -- to experience everything fully, deeply, and honestly without denying it or letting it overwhelm you. To see things as they truly are. And it's precisely such a transformation that allows Northup to so powerfully bear witness, not just to his own experience but to all the suffering of the others. You can actually track this change in Northup where it's most obvious near the end, in that scene where he's forced to brutally torture Patsey in front of everyone. He doesn't steel himself they way he might have earlier. He's fully present in that moment with himself and with her, and it's somehow, even in the midst of that horror, a little bit better for him and for her than it might have been otherwise. I agree that the arc is there to a certain extent and discernible if you look closely, but I feel that we would have bonded more strongly with the character if that arc had been more acute. I guess then I'm asking how you'd make that arc more acute, how you'd let the audience in more, without completely altering the nature of it. I feel like this kind of story -- about serious internal spiritual growth and struggle -- is pretty much the hardest kind of thing to do in the medium of film, which necessarily privileges external action. Some of the better ones I've seen use all sorts of tricks to distract us from what's really going on beneath the surface. Lest we notice that, externally, the protagonist is largely passive. Or that s/he's grappling with the big uncomfortable questions. I'm thinking of picaresque existential Western comedies like LITTLE BIG MAN and THE BALLAD OF CABLE HOGUE, whose subtexts tell tales of hard-won humility and profound acceptance. 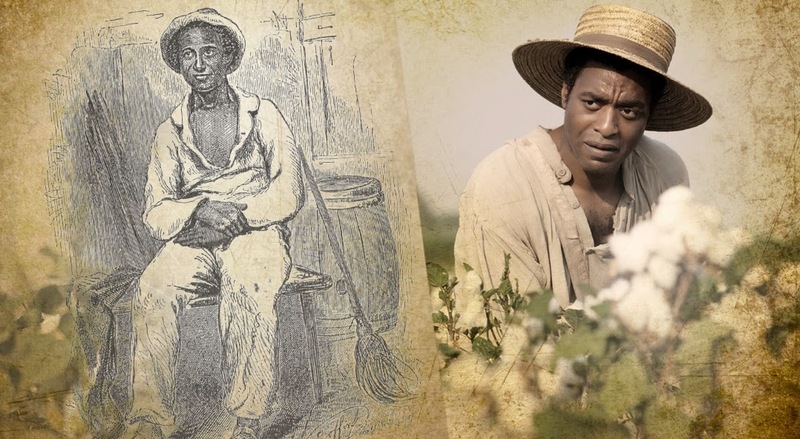 12 YEARS A SLAVE by its very nature can't be fun or funny. It can't fill the screen full of busy events -- as enslavement is largely about stasis -- or hide its seriousness behind anything. The suffering it foregrounds is relentless. Perhaps that's a part of why it's hard to see past it. But, as you've said, you have to show the all of the suffering, because anything less is a lie. And I think it would be an equal mistake to attempt to amp up Northup's internal struggle or externalize it in some kind of louder, less organic way just to make it more legible to even the most casual viewer. You'd probably wind up with a mediocre melodrama instead of the nuanced drama we have now. I agree. It's tricky. I would have liked a little more dialogue. What would I have done? - A scene before he's enslaved where his daughter asks him what a slave is and he tries to explain how they're different. - More scenes of him trying to explain to people that he doesn't belong here. - More scenes where Patty calls him on the carpet for thinking he's better. - More of a "corrected statement of philosophy" scene when he realizes the truth. 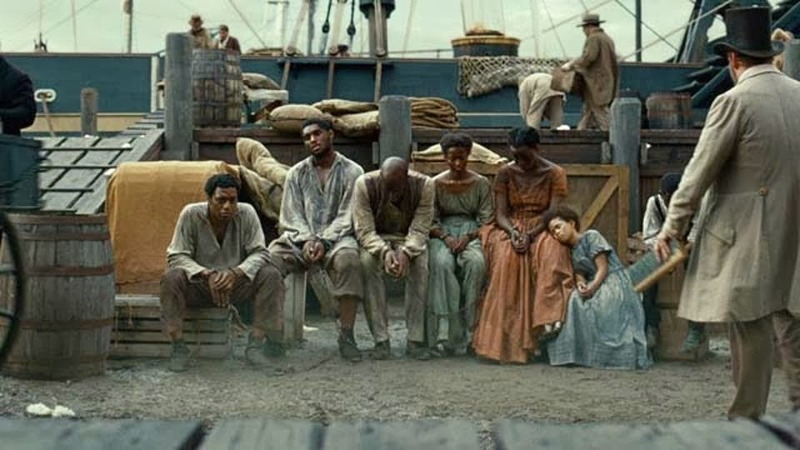 I agree that these all would have made the movie more melodramatic and less of a solemn testimony to this horror, and so they movie we got was probably the right way to do it, but if we had more raw movies about slavery, then this movie would be more free to milk Mr. Northrop's story for its drama, instead of being so solemn. Alright, I finally watched this movie, and I think I like the subtlety and don't feel the irony needed to be played up more. I'll point out the scene where, in a flashback, Northrup buys an expensive bag for his wife while a slave wanders into the store and watches in awe. Northrup doesn't play up his own superiority here; he tells the slave's master that the slave is "no trouble" (and should be allowed to enter the store). But it's one of those moments in the film where the audience is aware of the confusing separation between free Black man and enslaved Black man. Moments like this one underscore the irony without making Northrup the one who has to espouse his own superiority; the audience does it for him (feeling uncomfortable while doing so). I agree that the moment when Northrup sings the spiritual with the rest of the group was a moment when that tension in the audience finds some release. Northrup is no longer different from the other slaves. Then, when Northrup returns home, we're painfully aware of how his slave demeanor still hangs on him as he apologizes to his family for being gone so long. He has gone from superior to inferior, and it's a really sad moment, but also one that again underscores that idea that there's no difference between a man who's "supposed" to be free and any other slave.